Follow the story of the United States Navy from its birth during the Revolution through to today's modern fleet. Learn how Naval Academy graduates have led our nation's armed forces in times of war, explored remote areas of the globe, and advanced our scientific knowledge. 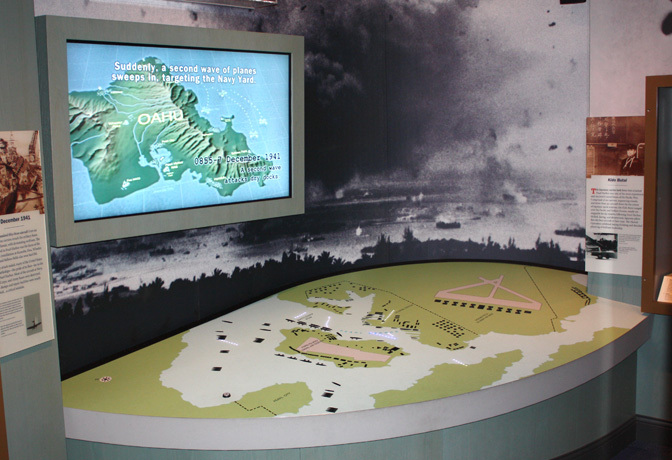 Interactive battle maps are placed throughout the first deck which illustrate the tactics used in many of America's major naval battles. The central part of the gallery is dedicated to the history of the Academy and shows how it has changed both as an academic institution and as a military post. Highlights of the first deck include Oliver Hazard Perry's famous "Don't Give Up the Ship" flag from the Battle of Lake Erie, a piece of USS Monitor, and a video and light display illustrating the attack on Pearl Harbor. The First Deck also contains the James W. Cheevers Gallery, home to our temporary exhibitions. 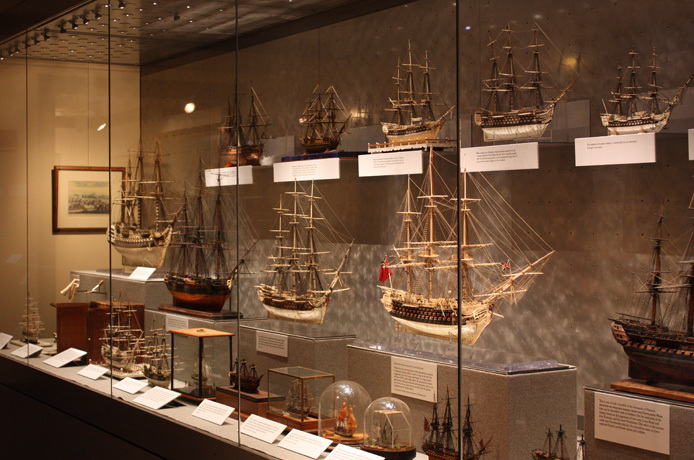 After watching a twelve-minute introductory video about the Museum, step out into the gallery to see the Rogers Ship Model Collection, the largest collection of seventeenth- and eighteenth-century ship models on public display in North America. More than seventy models in beautifully crafted display cases illustrate two hundred years of developments in warship design. The second deck is also home to the Beverley R. Robinson Collection, an exceptional collection of prints illustrating famous ships and naval scenes from the last 500 years. Click on the image to view displays on Second Deck. Watch our expert model-builders at work as they restore and clean old models and build new ones for the collection. 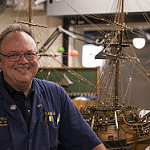 Our staff and volunteers are always happy to talk with visitors who are interested in the techniques used to create ship models.